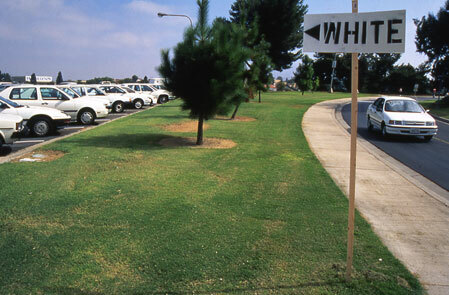 Cars are a defining feature of the landscape and social space of Southern California. Especially in San Diego, where freeways weave like dangerous ribbons through a terrain of strip malls and tract housing, driving is an almost inescapable part of daily life. 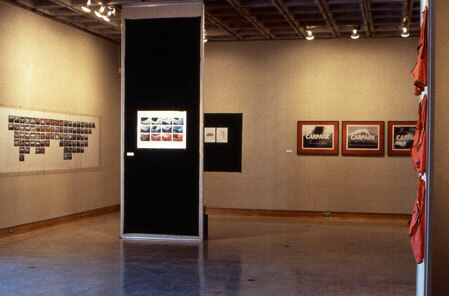 Nina Katchadourian, Steven Matheson and Mark Tribe were invited to work collaboratively on a site-specific project at Southwestern College in Chula Vista, California for inSite '94, a binational art exhibition that takes place at various locations throughout San Diego and Tijuana. 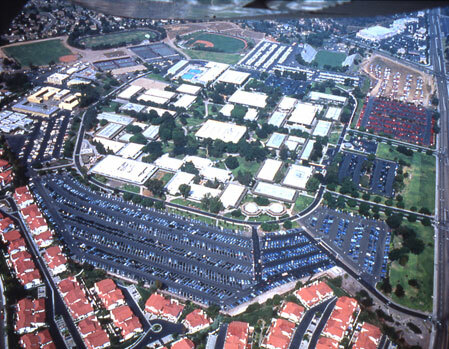 Southwestern College is surrounded by a moat-like ring of parking lots. You can't enter the campus without crossing a sea of concrete. 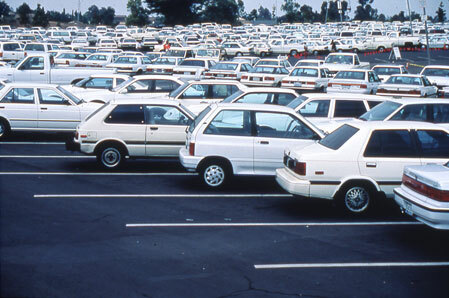 Each day, Southwestern's 3,477 parking spaces fill and empty several times with the cars of the students, faculty and staff who commute to Southwestern from all over the San Diego and Tijuana area. 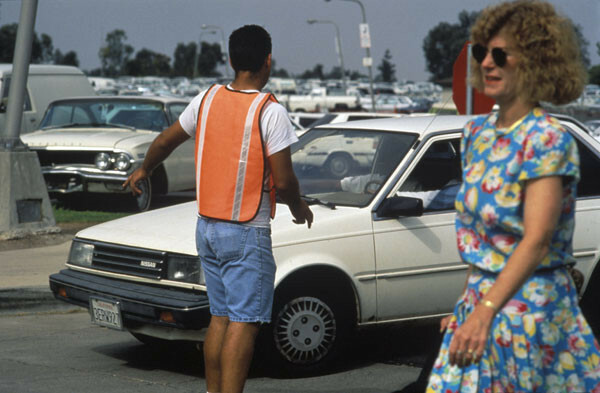 On August 31, 1994 from 6am to noon, a team of 50 professional and volunteer parking attendants directed the arriving cars to predetermined lots according to car color. 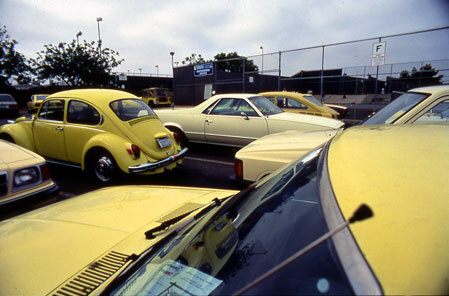 Each of the fourteen lots was filled with cars of a different color: dark blue, blue, light metallic blue, silver & gray, black, beige, brown, metallic raspberry, yellow, electric blue, white, aqua, green and red. Video and photographs were shot from the air and on the ground before and during the sorting. 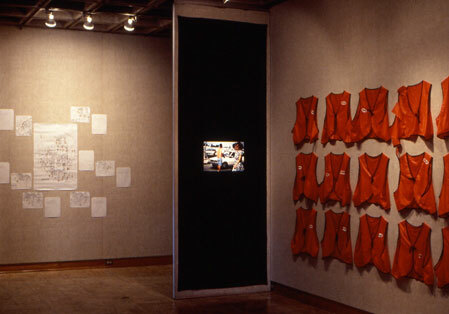 These documents, along with other materials such as street signs and the orange safety vests worn by the car sorters, were then exhibited at the Southwestern College Art Gallery. 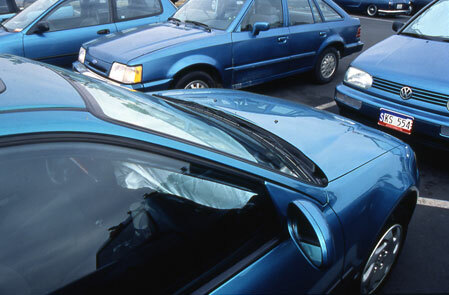 By choosing the parking lots as the focus of our attention, we transformed parking from a process in which individual drivers compete for space, into a kind of game in which the entire community participated. Usually we do all we can to make the process of commuting and parking disappear, to drown it in talk radio or lose it in a daydream. 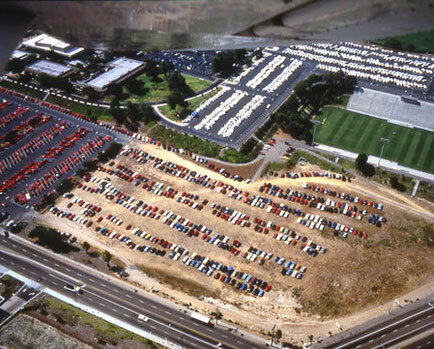 Freeways and parking lots form an arena in which Southern Californians vent aggression as they vie for social status. We wanted to exploit this situation, to use it as our canvas. 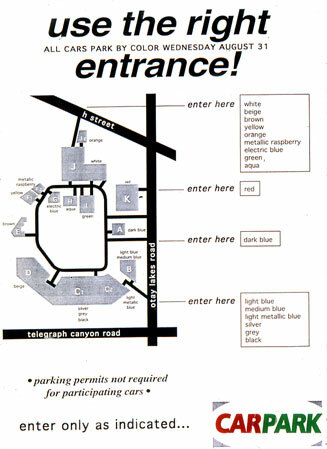 In an admittedly utopian fantasy of aesthetic perfection and social transformation, we sought to use the existing conditions of the site (the dimensions of the lots, the distribution of car colors) to produce a space that was both visually exciting and thought provoking. 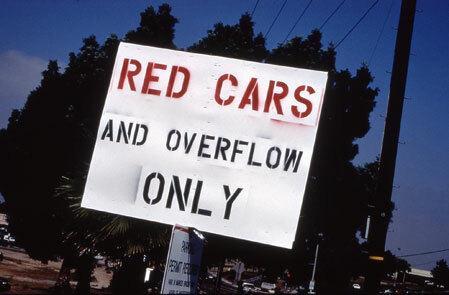 By erasing the false freedom in which drivers compete for the best spaces, Carpark brought to the surface the ways in which we are constantly submitting to institutional authority. 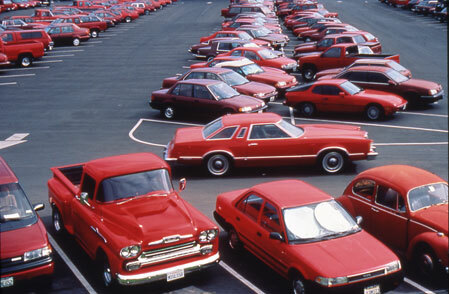 Someone said that Carpark was fascist art, and in a way they were right. At first, Carpark may have appeared to be an exercise in purification. But on another level, it was something different. 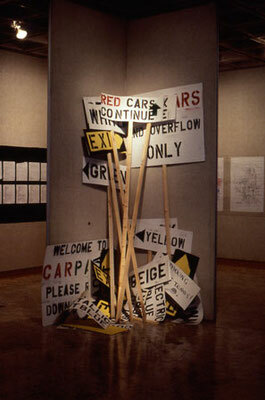 Surrounding the campus with an organized team of uniformed car sorters, we engaged the entire community in an endeavor whose conceptual function was, in fact, to undermine the ordering of social space in a small and unremarkable fragment of daily life.